If you are looking for a convenient salon perfect for the whole family, there is almost no easier option that the Walmart hair salon known as SmartStyle. 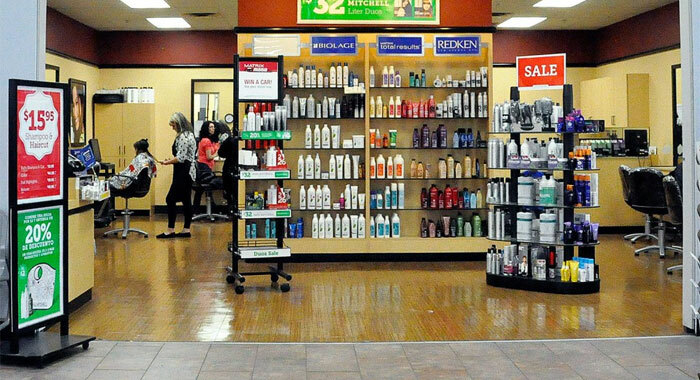 Located in a majority of the Walmarts across the country, this salon is easy to find and even easier on your wallet. SmartStyle prices start at $15.95 for adult haircut and go up from there depending on the service chosen. If you already shop at a Walmart near you, there is almost no other reason that you will need to go to SmartStyle, which is the name of the Walmart hair salon. Because there are over 2,000 of these salons across the nation, you will find them to be incredibly accessible whether you live in an urban, suburban or even somewhat rural setting. SmartStyle is also the smart choice for busy families. If you are a busy parent or business person, SmartStyle can save you time by letting you combine your regular hair appointments with the errands or grocery shopping that you are already doing. You can always find plenty of parking at any Walmart and never need to worry about setting an appointment as this salon offers walk-in appointments throughout all of their convenient salon locations. This salon is perfect for the whole family, completely affordable, offers all of your favorite haircare services and has plenty of friendly and knowledgeable stylists. With the service quality of Regis and Walmart prices, SmartStyle is a perfect combo. Walmart hair salons provide a full array of haircare services from haircuts to permanent and temporary styling. Whether you need a quick trim or are looking for a whole new look, SmartStyle offers just what you need. Plus, every haircare service here comes with a complimentary shampoo, conditioner treatment and scalp massage for no added charge. Haircuts are available for men, women and children. If you are looking for a bit more of a change or want to change things up for a special occasion, consider one of their many chemical services. Color services include all-over hair color as well as full or partial highlights. SmartStyle typically charges by the number of highlights that you want. Other services to consider include basic, specialty and Malibu conditioning treatments, full or partial perms, basic or luxury styling, relaxers and waxing of up to three areas on your face. All haircut services include a complimentary shampoo. One guard length all over. All coloring services include a shampoo and blow dry style. One foil color; add $10 for each additional color. All styles include a shampoo. Roller set, blow dry, braid, hot iron (ends or bangs). Blow dry and hot iron (all over), wrap. Updos, finger waves, freeze, hard press curls, barrel curls, flat iron and blow dry, roller set w/ wrap. Twist, windmill, piggyback, spiral curls, candlestick, straw set. All perms include a shampoo,l haircut, and express dry. All relaxers include hydrating conditioner and basic style. Includes straightening, curl, and haircut. Brow, Lip, and Chin available. Just like Walmart, SmartStyle offers nearly any salon-quality brand and type of haircare product that you could possibly need. Whether you are looking for a specialty product for curly, aging, thin, dry or oily hair or are simply looking for a shampoo and conditioner set perfect for everyday use, you will have no problem finding it here. SmartStyle sells all of your favorite haircare brands, including CHI, Joico, Kenra, Mizani, Sebastian and TIGI. You can also purchase electric appliances and handheld tools to help you style your hair. If you are hoping to save money but still get the same great look at home that you enjoyed while at the salon, consider SmartStyle’s budget brand from their parent company Regis. These DesignLine products are created for a wide array of needs and also include brushes and other hairstyling tools. The Walmart hair salon known as SmartStyle is a part of the enormous Regis Corporation, the largest worldwide hair salon corporation with over 10,000 salons total. Of those 10,000, SmartStyle encompasses over 2,100 of them. The Regis brand created SmartStyle to cash in on a great possibility. With Walmart hair salons, the brand can easily catch many customers who are already passing through Walmart running errands or doing their shopping. With the salon’s great customer service and amazing prices, the brand can quickly garner clients for life. SmartStyle was begun as part of Regis in 1998. It has quickly grown into 49 of the 50 states as well as into Canada and Puerto Rico. The corporation worked diligently and quickly to get SmartStyle salons into as many Walmart stores as possible in the shortest possible time. In just over 20 years, this desire has nearly come to pass. With a commitment to customer service, quality styling and affordable services, SmartStyle continues to maintain its current customer base while also reaching out to new clients who are passing through Walmart stores.